Red flames erupted from the base of the 66-meter tall Delta IV as its powerful main engine ignited before a package of four Solid Rocket Boosters fired up to lift the rocket off the ground at 23:53 UTC, 6:53p.m. local time, heading off to deliver the WGS-8 satellite to a highly elliptical orbit to join the U.S. Department of Defence’s Wideband Global Satcom System – a constellation of satellites ensuring round the globe coverage for vital tactical communications for military operations and in support of humanitarian aid. Riding on pillars of smoke, Delta IV brilliantly lit up a clear night over the Cape before turning to a south-easterly ascent path to deliver the satellite to a highly elongated Supersynchronous Transfer Orbit. The ascending rocket dropped its boosters a minute and 40 seconds after launch and continued toward orbit powered by the world’s most-powerful Hydrogen-fueled engine. WGS-8 was revealed when the payload fairing fell away from the rocket and the first stage shut down four minutes after liftoff, handing off to the cryogenic second stage which fired twice – first for fifteen and a half minutes to lift the stack into a preliminary Parking Orbit ahead of ten minutes of coasting and a second firing of just three minutes to raise the orbit’s high point to over 40,000 Kilometers. WGS-8 was sent on its way 42 minutes after Delta’s blazing nighttime liftoff to become the most-capable satellite in the Wideband Global Satcom Constellation, featuring the latest signals processing technology to further bolster tactical communications for U.S. military and allied forces. 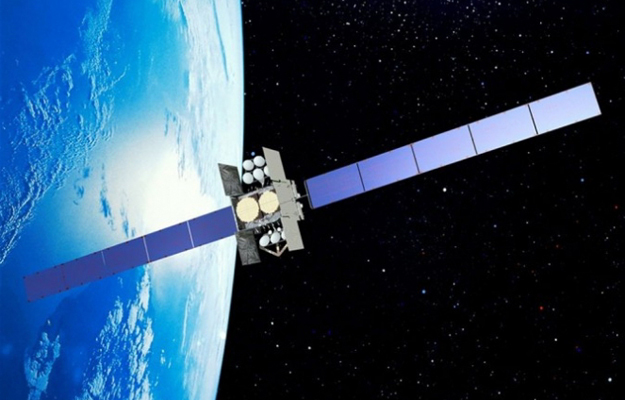 The Wideband Global Satcom System is the backbone of the U.S. military’s space-based communications architecture, delivering high-throughput services including video, voice and data communications with ships, jets, troops in the field and unmanned aerial drones. WGS is operated alongside the Air Force’s AEHF and the Navy’s MUOS communications systems that serve specialized functions for ultra-secure and mobile communications. WGS unifies the functions of the previous Defence Satellite Communications System and Global Broadcast Service while also increasing data throughput by a factor of ten over the heritage systems. Work on WGS started back in 2001 to create a state-of-the-art system incorporating commercial satellite technology for a maximum of flexibility in communications services. 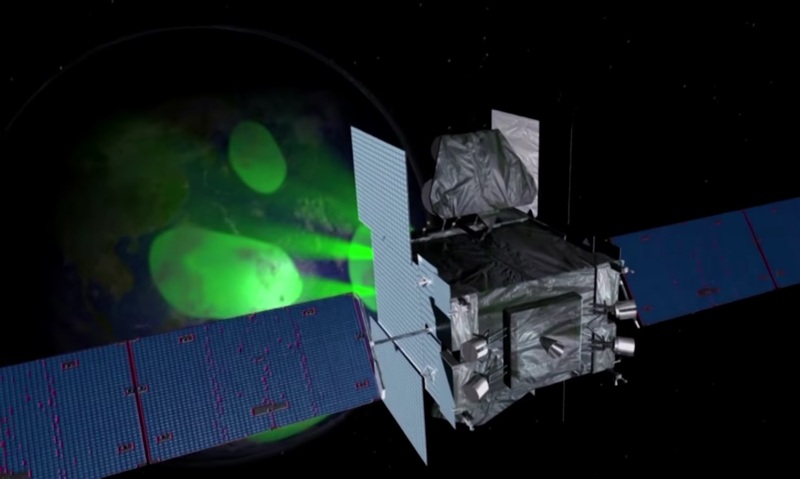 The satellites are built by Boeing Space Systems based on the flight-proven 702HP platform and host a powerful communications terminal that offers 19 steerable, high-capacity beams and a unique cross-band communications feature that allows the satellite to convert between up- and downlinks in the Ka- and X-Band frequencies. 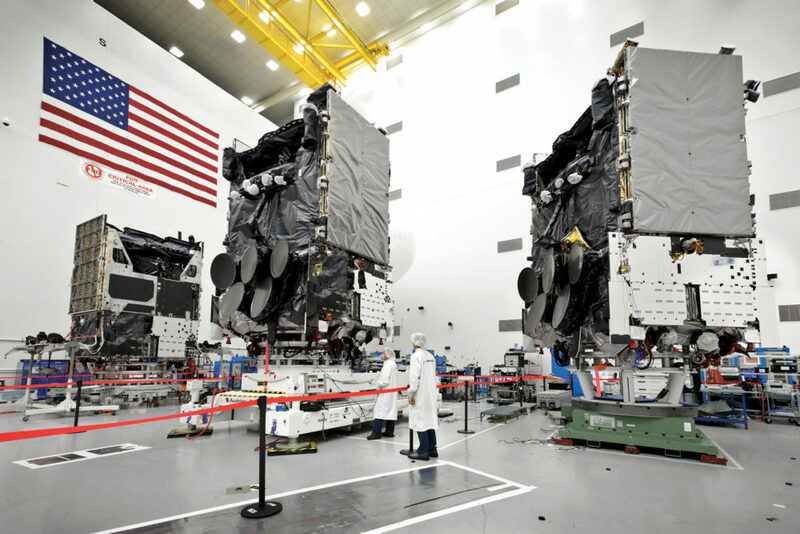 The first three WGS satellites, each with a data throughput of 2.1 to 3.6 Gigabits per second, launched in 2007 and 2009 before the Block II generation of satellites made their debut with the launch of WGS-4 in 2012. Block II offers a higher data throughput of 6Gbps and is optimized for supporting drones which require low-latency, high-bandwidth communications for video and command exchange. WGS-5 and 6, both belonging to Block II, launched in 2013 and the seventh WGS satellite went into orbit late last year. WGS-8 comes with a price tag of $426 million and represents an improved version of the Block II satellites, featuring a Wideband Digital Channelizer at the heart of the satellite’s communications package which is responsible for the conversion of uplink and downlink signals between the different frequency bands. Built around Application Specific Integrated Circuit Technology, the new channelizer enables a data throughput of 11Gbps – almost doubling the capacity of the previous Block II satellites. 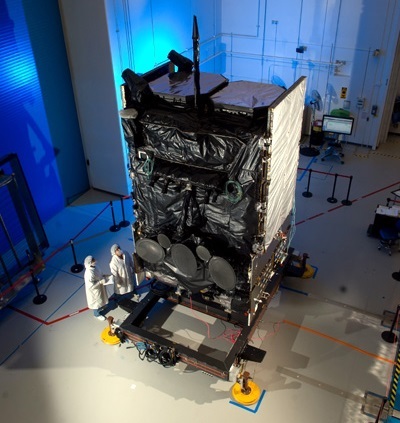 From their high-altitude perch in Geostationary Orbit, the WGS satellites each deliver 19 communication beams – nine electronically-shaped X-Band beams, ten Ka-Band beams provided by steerable antenna assemblies and a global X-Band coverage zone for broadcast services. 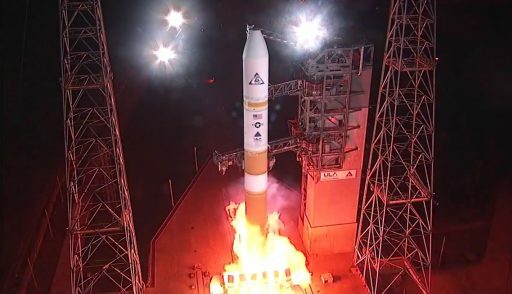 WGS-9 and 10 are set for liftoff in the next two years to finish deployment of the operational constellation with services accessible by the U.S. military, the White House and the State Department along with allied nations Canada, Australia, Denmark, the Netherlands, Luxembourg and New Zealand. The WGS constellation supports all types of communications from unclassified signals to encrypted services including mission-critical communications coming in the form of video relay from drones, voice calls and data messages such as battleground maps for troops in the field. WGS also delivers a higher standard of living to deployed soldiers by ensuring they can stay connected to the outside world via TV services and connect with their families through E-Mail. To lift the six-metric ton WGS-8 satellite into orbit, Delta IV flew in its most powerful single-stick version available. Known as the M+(5,4) configuration with four boosters and widened second stage, this particular version had only flown four times prior to Wednesday – all in support of the WGS program. Standing almost 66 meters tall atop its Space Launch Complex 37 launch pad, Delta IV was revealed seven hours prior to the opening of Wednesday’s 49-minute launch window to mark the start of a final set of preparations at the launch pad to get all systems buttoned up ahead of propellant loading. Countdown clocks started ticking down from T-4 Hours and 15 Minutes after an initial hold to facilitate the setup of the Launch and Range Control Systems ahead of powering up Delta’s flight control system for a series of pre-launch checks. The sun set upon the Cape Canaveral launch site while Delta IV was being loaded with 230 metric tons of -183°C Liquid Oxygen oxidizer and -253°C Liquid Hydrogen fuel. Tanking was by the book and the two-stage rocket stood fully fueled as teams completed the final set of preparatory steps, loading the appropriate flight software into the rocket’s computers and switching the WGS-8 satellite to internal power. 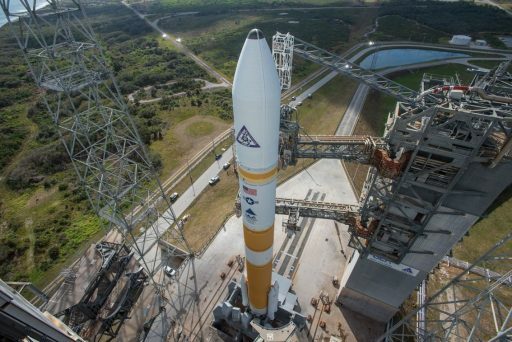 All Stations reported a GO to head into the final four minutes of the countdown during which Delta IV pressurized its tanks for liftoff, transitioned to internal power and checked off the final automated vehicle tests. The powerful RS-68A main engine soared to life five seconds prior to T-0, setting the orange insulation foam around the first stage on fire as is often observed during Delta IV launches, particularly spectacular for those occurring at nighttime. Upon ignition of the four boosters, Delta IV jumped off its launch pad at precisely 23:53:00 UTC – powering uphill with a total thrust of 657 metric-ton-force. 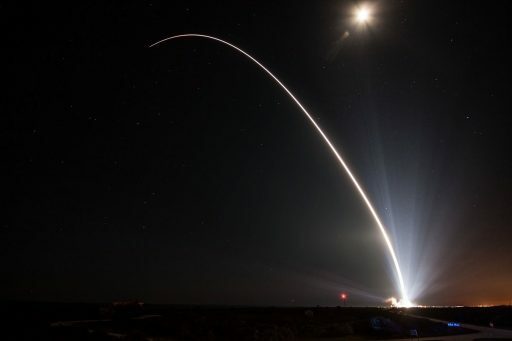 Delta IV maintained a vertical posture for just seven seconds, then pitching and rolling onto a launch azimuth of 93.5 degrees to swing to the south-east to home in on a Supersynchronous Transfer Orbit. The rocket – burning propellant at a rate of 2,200kg per second – passed the speed of sound just over thirty seconds into the flight followed by Maximum Dynamic Pressure 46 seconds after liftoff. Each of the four boosters exhausted their supply of 30 metric tons of propellants at the T+92-second mark, being held for another ten seconds before the 15-meter long SRBs dropped away from the core stage. Within two minutes of launch, Delta IV had lost half its liftoff mass, continuing towards an elliptical Parking Orbit powered solely by the RS-68A engine that generated a thrust of 363 metric-ton-force when flying in the upper reaches of Earth’s atmosphere. Three minutes and 15 seconds into the mission, the clamshell-type payload fairing split open and the two halves fell away from the rocket, revealing the WGS-8 satellite for the rest of its ride into orbit as aerodynamic forces no longer represented a danger. Shortly thereafter, the first stage began a gradual throttle back to limit acceleration on the vehicle in advance of shutting down the RS-68A engine three minutes and 56 seconds after launch. 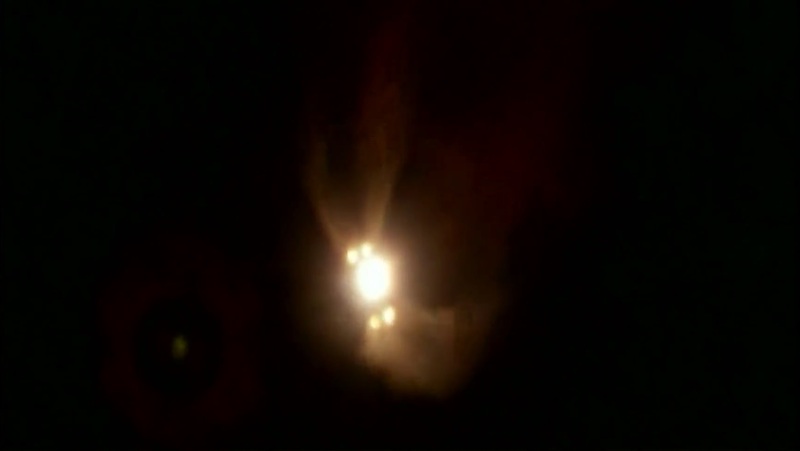 The 40.8-meter Common Booster Core separated six seconds after MECO, being pushed away to clear the Delta Cryogenic Second Stage for deployment of the RL-10B engine nozzle extension. RL-10B soared up thirteen seconds after staging and achieved its full thrust of 11,200 Kilogram-force to boost the stack into a Parking Orbit via a lengthy burn of 15 minutes and 37 seconds. Shutdown of the second stage was marked just shy of T+20 minutes when Delta IV arrived in an orbit of 185 by 6,080 Kilometers, inclined 27.6 degrees for a brief passive coast phase of only nine and a half minutes ahead of the critical engine re-start. Second stage cutoff occurred just south of Cape Verde with the vehicle’s orbital track passing over Liberia and Sierra Leone, marking the completion of a fast trip across the Atlantic Ocean. The coast phase was implemented to allow the vehicle to gain altitude so that the second engine firing could primarily serve as apogee-raising maneuver, but also increase the perigee to prevent excessive drag from slowing the satellite when passing the low point of its transfer obit. RL-10B re-started 29 and a half minutes into the mission and fired for a little over three minutes, aiming for an injection orbit of 435 by 44,378 Kilometers, inclined 27.0 degrees. 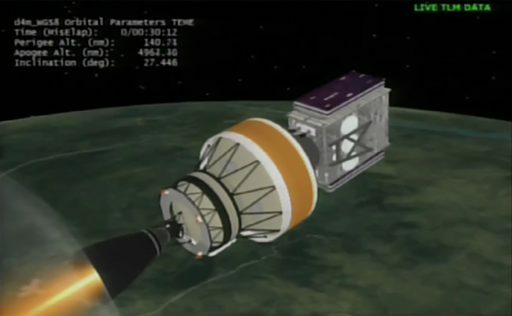 The burn was by the book and at its conclusion was another nine-minute coast phase that set up for the separation of the WGS-8 spacecraft. 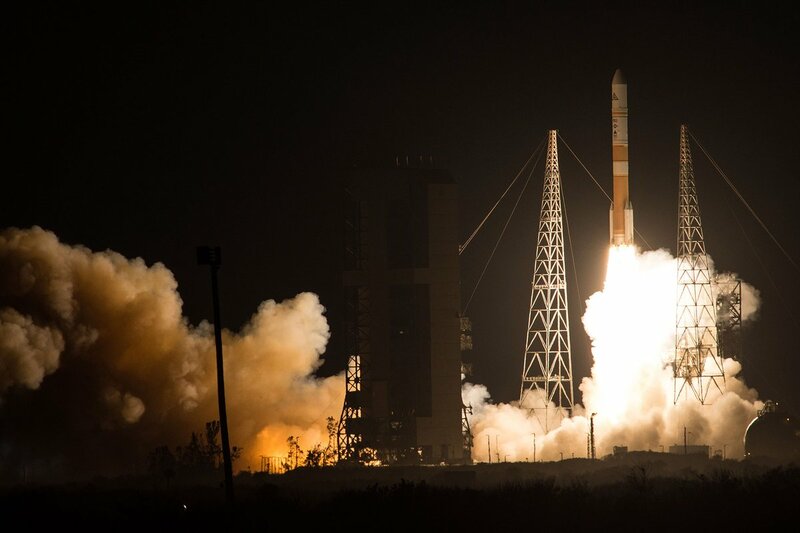 WGS-8 was released 42 minutes after liftoff to mark the completion of another flawless mission for the Delta IV rocket. The onboard navigation system of the second stage showed it arriving in an orbit of 435 x 44,337 Kilometers, 27.01° – very close to the predicted parameters. WGS-8 was intentionally placed in a lower orbit than previous WGS birds that aimed for a high point of 66,900 Kilometers and a lower inclination of 24 degrees. The use of the more powerful RS-68A on the first stage and slight fuel-saving measure on Stage 2 enabled the DCSS to retain sufficient propellant to conduct a maneuver to remove itself from orbit for space debris mitigation. 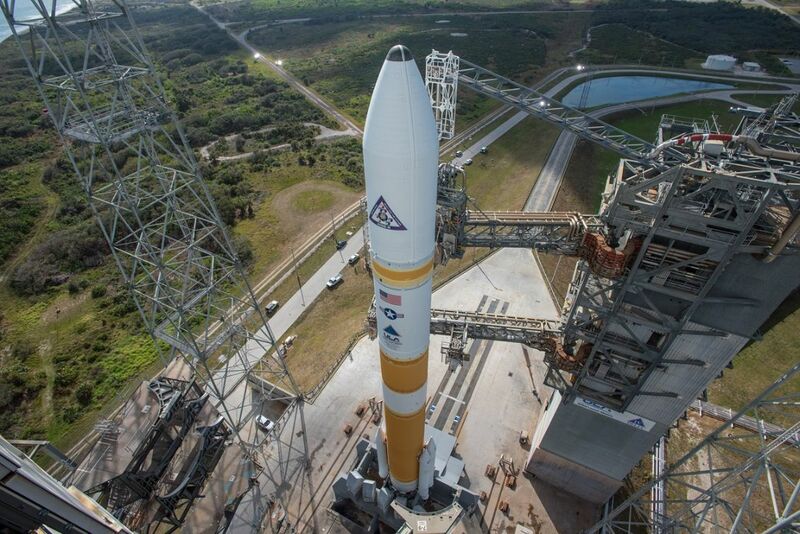 Wednesday’s launch marked the 376th mission of a vehicle named Delta in a program dating back to 1960. It was the 34th flight of the Delta IV and the 11th United Launch Alliance mission of 2016 including four missions of the Delta family. ULA is aiming for a full dozen this year with Atlas V scheduled for liftoff from Florida on December 16th with the EchoStar 19 commercial communications satellite.